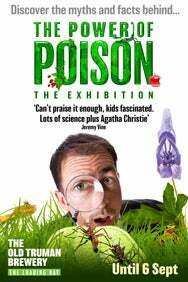 We do not curently have theatre tickets available for The Power of Poison. This could be because we have simply sold out or it could be that this show is no longer running. The information on this page remains purely for historical and informational purposes. Step inside the Victims and Villains Gallery and discover how, from Cleopatra to Napoleon, history is filled with famous poisonings, many of which remain unsolved. Explore how these figures may have died. Understanding Poisons Live Presentation. Throughout most of history, people had little understanding of what was poisonous, and why. Until the mid-1800s, when scientists developed forensic tools to detect poisons in the human body, many deaths remained a mystery. Get Interactive and solve case studies. Intentional poisonings are rare today, but accidental poisonings do happen. Using iPads visitors can investigate evidence, compare clues and weed out red herrings to figure out what poisoned a dog, an owl and Captain Cook.